While many will advise you on catching express buses to get to Woodlands Train Checkpoint for the Shuttle Tebrau to save time, the catch is if you enter the bus checkpoint by bus, you will not be able to backtrack out of the checkpoint unless you have a valid reason. Even if you have one, some formalities are needed before they will allow you to reverse back to Woodlands Train Checkpoint via the overhead bridge, wasting time and having a chat with an immigration officer for nothing. To get to Woodlands Train Checkpoint from the city, do not take any express buses as those will head straight into the bus checkpoint. If you really want to depart from Queen Street terminal, board the 170 red plate, including the short working 170A which terminates at Woodlands Train Checkpoint. Otherwise, just get on the MRT and alight at any of the following stations to connect to the following bus services. Please click here to visit the dedicated Shuttle Tebrau service information page. External links below will direct you to Johor Bahru Citybus Routes and MyTransport.SG. Click the service number to find out more about the exact routing of the bus. Click here for border crossing options after midnight (12.30am – 5.30am). Bus stop outside Bukit Panjang MRT Exit B. Bus stop opposite Kranji MRT. Bus stop opposite Marsiling MRT. **although 912 goes to Woodlands Train Checkpoint, you are NOT advised to use it as it goes by a very long route. Queue at Woodlands Temporary Bus Interchange. The bus services heading back to the MRT stations are a little different, as Woodlands Train Checkpoint is located on a one way loop road and the buses only pass there once in their journey. *while signs at the bus stop will suggest 912 as well, it goes by a very long route. You will be better off just waiting for the next bus. Bus stop outside Woodlands Train Checkpoint. The estimated total journey time from the city to Woodlands Train Checkpoint is about 1 hour 30 minutes. To get to JB Sentral from the city quickly, you may take express buses that depart from the city. Estimated travel time including immigration and customs clearance is about 1 hour from the city during off peak periods, stretching to 4 hours during super peak periods. Express buses are also available from Changi Airport. Special Note: For Causeway Link buses, take any same-company bus that bears any service number (ie. any Causeway Link bus for CW1, CW2, CW5) between Woodlands Checkpoint and JB Sentral. There will only be one queue formed for each company’s bus services. After clearing Malaysian immigration, get on the actual bus departing to your destination, if required. If in doubt, ask any staff on hand. Enquiries can be made at the Transtar counter at the arrival hall of each terminal. Board the bus at the coach bay at each of the terminals. Waiting area at Resorts World Sentosa. For cheaper options, you may also wish to take local buses that stop at every bus stop. Queue at Jurong East Interchange. Bus Stop outside Kranji MRT. *170 will go around Woodlands Centre Road (Woodlands Train Checkpoint) before heading to Woodlands Checkpoint. Special Note: For SBSTransit and Causeway Link buses, take any same-company bus that bears any service number (ie. any Causeway Link bus for CW1, CW2, CW5 and any SBSTransit bus for 160, 170, 170X) between Woodlands Checkpoint and JB Sentral. There will only be one queue formed for each company’s bus services. After clearing Malaysian immigration, get on the actual bus departing to your destination, if required. If in doubt, ask any staff on hand. Queue at Yishun Temporary Bus Interchange. Queue for all Causeway Link buses. Special Note: For Causeway Link buses, take any same-company bus that bears any service number (ie. any Causeway Link bus for CW1, CW2, CW5) between JB Sentral and Woodlands Checkpoint. There will only be one queue formed for each company’s bus services. After clearing Singapore immigration, get on the actual bus departing to your destination. There will be individual queues for each bus service. If in doubt, ask any staff on hand. Queue for all SBSTransit buses. Special Note: For SBSTransit buses, take any same-company bus that bears any service number (ie. any SBSTransit bus for 160, 170, 170X) between JB Sentral and Woodlands Checkpoint. There will only be one queue formed for each company’s bus services. After clearing Singapore immigration, get on the actual bus departing to your destination. There will be individual queues for each bus service. If in doubt, ask any staff on hand. Queue for Advance Coach buses. Special Note: For Causeway Link and SBSTransit buses, take any same-company bus that bears any service number (ie. any Causeway Link bus for CW1, CW2, CW5 and any SBSTransit bus for 160, 170, 170X) between JB Sentral and Woodlands Checkpoint. There will only be one queue formed for each company’s bus services. After clearing Singapore immigration, get on the actual bus departing to your destination. There will be individual queues for each bus service. If in doubt, ask any staff on hand. Thanks for this post! 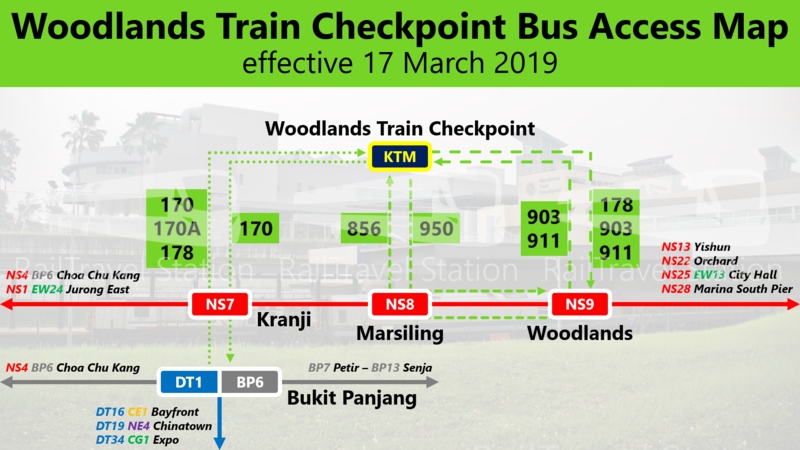 Can I just confirm – if one is planning to board a train at Woodlands or pick up train tickets in advance, is it best to take a local bus, as the express buses stop at the bus checkpoint and not the train checkpoint? Hi, thanks for dropping by! Please use the local buses that go to Woodlands Train Checkpoint. Some buses like 160 & 170X still go direct to the Woodlands Checkpoint for buses and it’s not where you would want to end up at. Thanks for the reply! I will be in Singapore and Malaysia next week – your blog has been very helpful. Hi, if we have already pre-booked the tickets for shuttle Tebrau at 9.30am, approx. what time do we have to arrive at the train checkpoint? My concern lies with the immigration checks.. are these checks done before boarding the train or after? thanks! The gates will close approximately 15 minutes before the departure time, so in your case, they close it at around 9.15am. Go up the bridge where the entrance is, they will check your tickets first. After that, follow the path to Singapore immigration, followed by Malaysian immigration and customs. You board the train after that. That’s all the checks for the northbound journey. hai, i need to catch the train from jb sentral to kl sentral at 10:30pm, when should i book the shuttle at 6:00pm or 8:30pm, how much time does it take to clear the immigrations, and how do i come from sentosa to the woodlands checkpoint through mrt?? From Sentosa, I’d rather you take TS8 from RWS. Journey time approximately 2 hours from Sentosa to JB Sentral. Get on the 6pm or 7pm bus to be safe. 7am, immigration time 5 minutes, it’s exclusive for train passengers. Exit the platform at JB Sentral with everyone else first, and re-enter at Gate A. Book your shuttle tickets at the same time as your KL Sentral – JB Sentral ticket to ensure availability, the morning shuttles always get sold out at least 1 day before. If your train is delayed, get a new ticket for the 8.30am shuttle at JB Sentral. I tried booking via online for tickets on 29 august 2015 from singapore to jb sentral. But the page seems not making any sense, meaning im unable to click on the train time . Are you unable to click on the train time or is it not showing up? Are you logged in with an account? Yup ive created an account to login. The problem im facing is that im unable to click on the time selection for the train. Try using Google Chrome. After you choose “WOODLANDS CIQ” followed by “JB SENTRAL”, click the date for “29-AUG-2015”. 7 trains should show up. Click on the preferred train, followed by coach and seat number. After you’re done, click add and fill in the passenger details, and choose a seat. While the train is free seating, choosing the seat number is required to limit the 320 tickets sold per train. By the way, booking online goes for a poor exchange rate of RM3 to SGD1, ie. RM15 for a $5 ticket. How am i to know if its fully booked ? Cause it doesnt shows any icon. Hi! I’m Currently planning a trip & i’m coming from Singapore. I want to catch a train that’s leaving to Butterworth at 8.40 am so i’ll need to catch the 8am shuttle train as it will reach JB sentral at 8.05am, is that a safe timing or should i take the 6.30 train timing and reach at 6.35am. Also, for the train tickets towards butterworth, should i book in advance or is it possible to make purchase on the day itself? Thanks! Hi, when do you plan to go for your trip? There will not be any trains direct from JB Sentral to Butterworth then. ohhhh, so right now just got to wait till Jan to see the changes they’ve made? Thanks! Yup, or you can stay tuned to the RailTravel Station Facebook page which will post the update as soon as the information is available publicly. Hi,I plan to take train from jb to singapore. After checking the passport at woodland train checkpoint, how can I go to Hougang? on line? which website to go to? or if I buy at the counter for the 9.30am train, what time must I be there to buy the ticket.? Saturday beside 9.30 am , do you have another train at 10.00am or 10.30am? You can book online here: https://intranet.ktmb.com.my/e-ticket/login.aspx , but unfortunately tickets for 8am and 9.30am are already sold out. Please visit http://railtravelstation.com/2015/07/04/shuttle-tebrau-woodlands-ciq-tofrom-jb-sentral-by-train/ for more information. RailTravel Station is not a club nor affiliated with any company. Thanks for the information. I have book KTM tickets from Singapore to JB sentral on 29 Dec . If I take a cab to the KTM train station in woodlands checkpoint will I be caught in the same jam as those cars queuing to go to JB? No, the Woodlands Train Checkpoint is accessible from Woodlands Centre Road and not from the vehicle checkpoint. Hi..trying to buy the tebrau train shuttle tickets online for the specific timing (eg 0930hr) but prompted its fully booked. The same for the return (eg 1600hr). My question is, if I go to Woodlands train checkpoint KTM ticket counter, will they sell me the tickets there? BTW, do they allow standing in the train cabin in the instance where they have oversold the tickets? No and no. However the 320 tickets allocated will still have standees on the train. Yes but it wouldn’t make sense to do that as you’ll be first paying extra for the shuttle train ticket and the fare for the bus in SGD for the same-number price as when paid in JB Sentral in MYR. Thank you for your advice. I am afraid the shuttle bus may stuck in the jam at the causeway, so the logic is to beat the jams by taking train to the ciq, then board the direct shuttle bus to changi airport. It’s going to be the same bus. Hi i want to go to Johor bahru from serragon road if we will ride a train what station we will take? It depends on which part of Serangoon Road you are at. The alighting station is the same no matter where you come from. Hi, is possible to brings luggages on the train? And is ideal to take taxi from Changi to Woodlands Train Checkpoint? Many thanks for your help. hi, i will go to johor bahru from singapore. I’ve already bought the train ticket on website for 1st oct 2016 at 12.00 PM. I will go from MRT Bugis to MRT Marshiling. What time must i go if i will go by train at 12.00 Pm? If i walk form marshilling to woodlands train check point, is it too far? how long does it take on foot? if i use bus no 856 to Woodland Train Check Point is it free or i must pay? how much? ok. so for the bushow much do i pay from marshiling to woodlands train check point? Please use MyTransport.sg for the fare from wherever you are starting from to Woodlands Train Checkpoint. It’s distance-based. In case we use express buses to save time, you said “the catch is if you enter the bus checkpoint by bus, you will not be able to backtrack out of the checkpoint”. Why do we need to back track out of the checkpoint? Do you mean this applies only to people who want to take the train because the checkpoint for train is different? Do we need to back track if we just try to go catch the bus at Larkin Terminal in Johor Bahru? As this guide is for “Getting from Singapore City to Woodlands Train Checkpoint”, the directions here are pointing you towards Woodlands Train Checkpoint. Please also further define “to go catch the bus at Larkin Terminal” – which bus and direction are you travelling in? Example 1: if I take 170 from JB checkpoint and then take 170x from SG checkpoint towards Kranji station, will it be considered as continuing the journey on the same bus? Eg 2: if I take 170 from JB checkpoint and then take 160 from SG checkpoint towards Kranji, will it be considered as continuing the journey or will I be charged for changing bus? Eg 3: for any of the above 2 examples, I pay by cash instead of ez-link card, will any of the above still apply the same way? That’s cos I’m retaining a bus ticket instead of tapping the card. Card: Doesn’t matter – special Distance Fares rules apply for 160/170/170X on the shared cross-border section. Cash: Purchase your ticket as to Kranji station, not two separate tickets. Payment can be made in SGD or MYR at the fare number. Thanks. What about 950? Does special distance fares apply? For AC7, SJE, TS1 & TS8, passengers can only board back the same bus, as the ticket is not interchangeable with other bus services.